My new cross-body bag's sent my shoulders and neck on a blissful vacation! My friend Susan gave me the "Dinner" model from a line called Tenacious, and I've been carrying it daily. 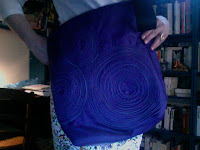 The bag is ample but feather-light, made of microfiber in vibrant colours or interesting neutralish tones; mine is intense purple lined in lavender, with dusty turquoise stitching. Washable, sturdy, well-made; price for this model is $80 (in Canadian dollars). Tenacious bags are hand-made by Nancea Whitham, and sold at Case Goods Warehouse in Toronto's Distillery District, or by contacting Nancea through the Tenacious web site. Nancea also makes pillows, quilts, computer cases and sketchbooks in her signature concentric-circle stitching. 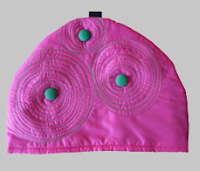 Shown, pink tea cozy. Other bag models include a tote (far left), messenger (left), and three sizes of the cross-body, called Breakfast, Lunch and Dinner. You can choose your colour of body, lining and stitching by contacting Nancea via her web site. Colourful, charming, locally-made, washable and body-friendly: adds up to a gift I deeply appreciate. Products like this make me so happy -- great to see a woman building a business making useful, attractive items that other women will enjoy! That it's local (for you) is even better. Cute stuff! My most recent bag purchase was for MrB though. He desperately needed a new manbag! Duchesse: Thought you might be interested in my daughter's blog which she's recently resurrected -- http://dramaticsprout.blogspot.com -- a change of direction! I love the pattern in the fabric! How nice to find something from a local artisan. metscan: Nor do I, and a local source for fine handmade products is such a delight! materfamilias: Meg's reasons are so similar to my son's; I'm asking him to read this. Thanks! Pseu, materfamilias: Nancea will fulfill web orders. Great bag to go with casual outfits! Excellent for shopping where you want both hands free. Love so many things about this post! 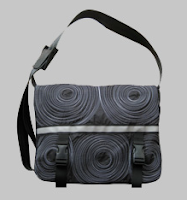 Supporting a local talent, the sheer beauty of this item, your enthusiasm... Yay, Tenacious bags. i just stumbled across this blog and wanted to say thanks! it's always great to get feedback on a product! i am so happy you are enjoying your new dinner bag! PS: my summer sale started today... stop by if you're in the distillery district!